The traffic in the Bay Area regularly ranks among the nation's worst — and sitting in traffic isn't just irritating; there's some downright unhealthy stuff in that air you're breathing. 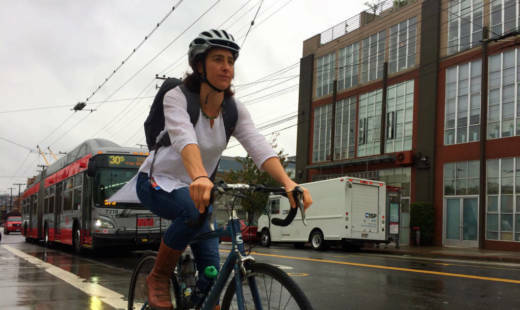 You can greatly reduce air pollution while biking by riding a block off of a busy road. I decided to try it on my own daily commute from Oakland to San Francisco, using the same gear borrowed from the Air Resources Board. Over the course of a few days I measured the pollution while I biked, then rode BART, and finally drove to my office. Even though my little experiment was clearly not scientifically significant, the results generally matched what the researchers found in Sacramento. Lesley McClurg preparing air pollution measuring devices before her morning commute. BART was the clear winner for me. Light rail also exposed Sacramento commuters to the least polluted air. Driving came in second for me, and biking exposed me to the most smog. The researchers found pollution levels to be pretty similar for cars, buses and bicycle trips. I didn't take a diesel-powered train, but the Air Board noted that older Amtrak trains on the Capitol Corridor exposed participants to the worst air. However, Amtrak is updating its locomotive fleet with newer models, so future trips should be a lot cleaner. Incidentally, high-speed Rail, when in service, will be even cleaner. Fortunately, none of the pollution levels I recorded during my commute — biking or driving — were dangerous. Study participants in Sacramento were also well within safe exposures. 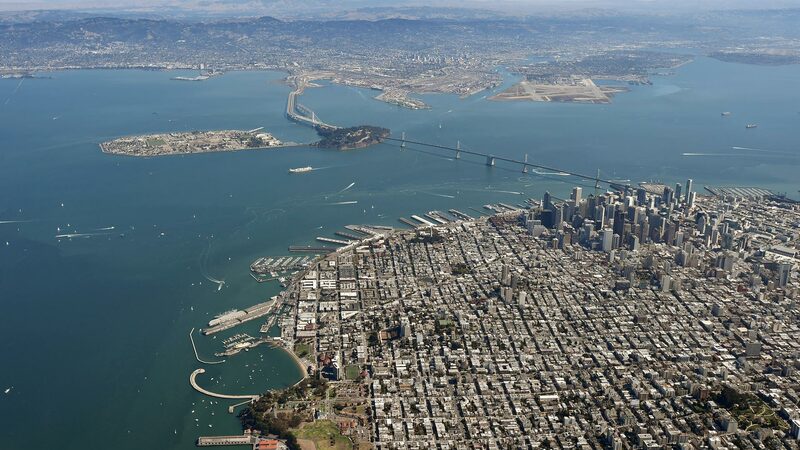 A street-by-street look at pollutants in San Francisco and Oakland. Aclima and Google plan to soon offer an interactive map where you can click on a particular street for more detailed information. To learn more. Below is a list of ways to protect yourself from nasty air while taking various forms of transportation. Black Carbon: Known more commonly as soot. It usually comes from diesel trucks, but ships, diesel trains, vehicles, residential wood fires and even certain types of cooking can also release black carbon. It can worsen asthma and heart disease. Nitric Oxide (NO): A gas emitted by power plants, vehicles, aircraft, ships, trains, soils, nitrogen fertilizers, the burning of biomass and gas-fired appliances. High levels can irritate skin, eyes and mucous membranes, triggering coughing fits and a burning sensation in the chest. Nitrogen Dioxide (NO2) : A gas released by burning fuel, forest fires and emissions from vehicles, power plants and off-road equipment. Breathing NO2 also irritates the lungs. When NO2 combines with other chemicals in the atmosphere it can lead to acid rain. My trip on BART from Oakland to San Francisco offered the best air. In general, the Air Board found electrically powered light rail to be the cleanest mode of transportation. That's likely because the trains themselves do not release any exhaust. However, the researchers cautioned the results may be different if the route is near a freeway. My car trip was the second best. The Air Board said turning the air-conditioning on and setting it to recirculate (versus pulling in air from outside) can reduce pollution levels by up to 75 percent. In other words, roll up your windows and prevent as much air as possible from entering when driving through congestion. As an avid cyclist, I was disappointed to learn that I was exposed to the dirtiest air while on two wheels. I'm going to try to find a less congested route because the Air Board says you can greatly reduce air pollution simply by cycling a block off a busy road or on bike paths away from heavy traffic. Researchers found that commuters taking diesel trains were exposed to the worst air over other modes of transportation. It's best to avoid older diesel-powered trains that push rail cars, which were worse than engines that pulled cars. If you must take an older train, try to get a seat in a cabin away from the locomotive engine. Air quality can change day-by-day and block-by-block. It's a good idea to check the current pollution levels before deciding what mode of transportation to take. You can check your neighborhood at airnow.gov, or sparetheair.org. This is especially important when there is a wildfire burning in the region or a temperature inversion layer puts a lid on the area, preventing pollutants from escaping. Sharing a vehicle not only shortens the trip because you can zip along in the carpool lane, it also means you're on the road for less time breathing bad air. Plus carpooling is a win for everyone because it means fewer cars are on the road spewing emissions and adding to congestion.